Media captionUS Secretary of State John Kerry: "The two-state solution is now in serious jeopardy"
Israel's PM said Mr Kerry's speech was "obsessively focused" on settlements. Earlier, US President-elect Donald Trump tweeted in support of Israel, saying he would not allow it to be treated with "disdain and disrespect". He urged Israel to "stay strong" until he assumed office next month. More than 500,000 Jews live in about 140 settlements built since Israel's 1967 occupation of the West Bank and East Jerusalem. The settlements are considered illegal under international law, though Israel disputes this. A "two-state solution" to the decades-old conflict between Israelis and Palestinians is the declared goal of their leaders and many international diplomats and politicians. Mr Kerry said: "The two-state solution is the only way to achieve a just and lasting peace between Israelis and Palestinians. It is the only way to ensure Israel's future as a Jewish and democratic state. That future is now in jeopardy." He added: "The Israeli prime minister publicly supports a two-state solution, but his current coalition is the most right-wing in Israeli history with an agenda driven by the most extreme elements. "The result is that policies of this government, which the prime minister himself just described as more committed to settlements than any Israel's history, are leading in the opposite direction. They are leading towards one state." 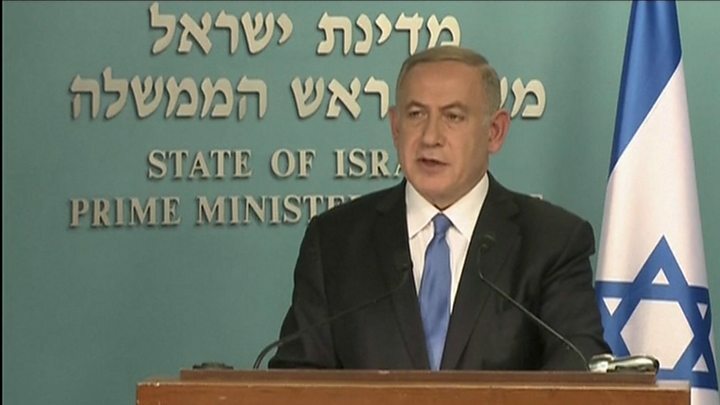 In his reply, Israeli Prime Minister Benjamin Netanyahu said he was disappointed with the US secretary of state's speech, which he said was "unbalanced". 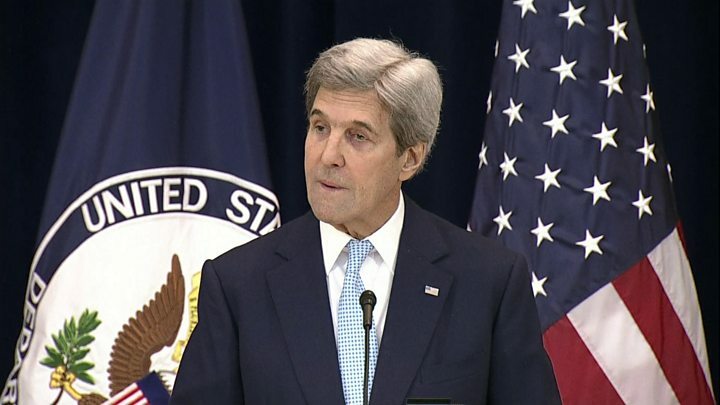 Mr Kerry, he said, had "paid lip service to the unremitting Palestinian campaign of terrorism" against Israel. The conflict, Mr Netanyahu added, centred on the Palestinians' refusal to recognise Israel's right to exist, but Mr Kerry "does not see the simple truth". A spokeswoman for the Palestinian Liberation Organisation, Hanan Ashrawi, told the BBC that Palestinians had adhered to past agreements but the Israelis had not. "We have accepted the two-state solution and we've acted accordingly and we have honoured all our commitments as per the declaration of principles and the agreements," she said. "Unfortunately it's Israel that has violated all its commitments, all the agreements and that is constantly now stepping up, as John Kerry said... its settlement activities and in an insane manner that is... specifically planned to destroy the two-state solution." In two tweets issued on Wednesday morning New York time, Mr Trump said: "We cannot continue to let Israel be treated with such total disdain and disrespect. "They used to have a great friend in the US, but... not anymore. The beginning of the end was the horrible Iran deal, and now this (UN)! Stay strong Israel, January 20th is fast approaching!" Critics have urged the president-elect to use more conventional channels to communicate on international matters. Mr Netanyahu replied on Twitter: "President-elect Trump, thank you for your warm friendship and your clear-cut support for Israel!" The UN resolution passed last Friday stated that the establishment of settlements "has no legal validity and constitutes a flagrant violation under international law and a major obstacle to the achievement of the two-state solution and a just, lasting and comprehensive peace". Meanwhile, an Israeli committee has postponed a vote to authorise construction of almost 500 new homes in Jewish settlements in occupied East Jerusalem. The move apparently follows a request from Mr Netanyahu's office.